I don’t usually do these quickie recipe posts, but this is such a great lunch it seemed a shame not to share it. Traditionally this would be served on a bed of lettuce, but I prefer it as a salad or rolled in lettuce leaves as a lettuce wrap. Salt, pepper, sugar to taste. season mayo-mixture to taste with salt, pepper and sugar. ← What’s Being Served At The Ex – Cronut Burger, Nutella Fries, Bacon Lasagna. 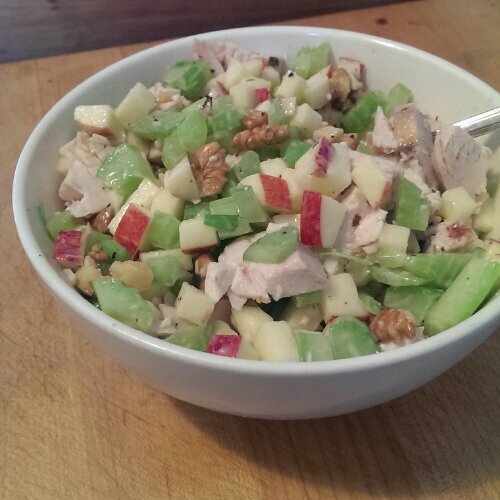 what about all the hard work i put into cracking those walnuts for the waldorf salad? grrrr well… “quick and easy” for me. Thanks again for doing all the cracking!